In late January Japanese citizens responded to a $200 million ransom request by ISIS for two Japanese hostages with a “memefest” caption contest, photoshopping images of the ISIS captors and hostages. The hashtag associated with the posts, #ISISクソコラグランプリ, roughly translates to “ISIS crappy collage grand prix,” and has been used more than 67,000. To lend humor to the otherwise grim image, the photo was enhanced with everything from selfie sticks to llamas and lightsabers to Mickey Mouse ears. At first, the memes might seem like an immature response to a serious situation, but they accomplished two important things: They allowed Japanese citizens to feel empowered in a scary situation that is ultimately beyond their control, and they undermined the authority of ISIS by using popular culture as a weapon against an organization that’s desperately trying to exert cultural dominance. The ISIS memes essentially allowed the citizens of Japan to banner drop ISIS’s virtual headquarters, which something they couldn’t have realistically done in real life. Another politicized meme that recently blew up on social media is the Tumblr Saved By the bell hooks, which superimposes quotes from feminist author and activist bell hooks over images from the 90s sitcom "Saved by the Bell." Yes, it’s funny and clever and nostalgia-inducing, but it’s also powerful. 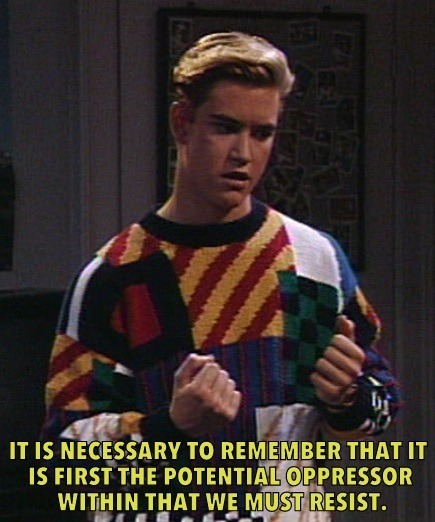 Seeing the words, “It is necessary to remember that it is first the potential oppressor within that we must resist” over an image of Zack Morris clenching his fists, or “The beauty standard was a reflection of white supremacist aesthetics” over an image of a grinning Kelly Kapowski creates a jarring juxtaposition for 90s kids. 'Saved by the bell hooks' calls out the race, gender, and class stereotypes that are perpetuated in much of the popular culture we have been consuming nonstop since childhood. The creator of the site explains, "The inspiration for it was a combination of a knack for wordplay, an interest in critical theory applied to media, and a growing familiarity with bell hooks. Her work has taken on new meaning for me as a white woman in a post-Ferguson context. As the topic of race relations steeped mass media, I think each of us began reexamining our roles and how they interact with the rest of the story." Over the last ten years, America’s opinions about gay marriage have undergone a dramatic shift. In 2004, only 35% of Americans supported legalizing gay marriage, while about 60% of opposed it. Thanks to a concerted effort by LGBTQ rights activists, the courage of gay friends and family members who speak openly, and the viral nature of showing support for marriage equality, by September of 2014, a majority of Americans—52%—favored the legalization of gay marriage. Because public opinion has so drastically changed, many republican politicians (not to mention President Obama) have changed their stance on gay marriage, paving the way for meaningful changes in legislation. Richard Dawkins, the evolutionary biologist who invented the term “meme” in his bestselling book The Selfish Gene, originally used the word to describe an idea, behavior, or style that spreads from person to person within a culture through imitation, evolving and changing over time like our genes do. As they evolve, memes change us, too--the ways we think about and interact with the world are altered by our shifting shared culture. Internet memes work similarly, but with an important difference: they’re changed intentionally as they pass from person to person, rather than evolving on their own. Politicized memes that go viral work like good marketing does: they make us identify with them. They engage both our emotions and also our intellect, and when we “get it,” we feel cool for being in on the punchline and up on a trend. Marketers have been using these strategies to sell us stuff for decades, and there’s power in subverting those techniques to create positive change in the world. Viral internet memes are highly effective at rapidly, intentionally spreading new ways of thinking about the world. We’re beginning to see indicators that ideas about internet slacktivism might be shifting. Just last week MTV, The Washington Post,UProxx, and lots of other outlets wrote about a study by PhD students at the University of Saskatchewan that suggested the feminist Ryan Gosling meme actually makes men more feminist. The methodology of the study has been called into question, but the fact that PhD students and major news outlets are exploring whether a viral internet meme can change hearts and minds is a significant indicator that at the very least, memes have the power to expand the reach of some of the most important conversations we’re having. So if there’s a moment where you pause to worry whether being excited to create or repost that clever meme designed to fight racism, sexism, homophobia, or even terrorism makes you a slacktivist--don’t. Do make sure you supplement your internet activism by getting out and doing more for the causes that matter to you--there is no replacement for time, energy, and funds devoted to a cause in the real world. But for this moment, right now, while you’re sitting in front of your computer, meme away. It matters.